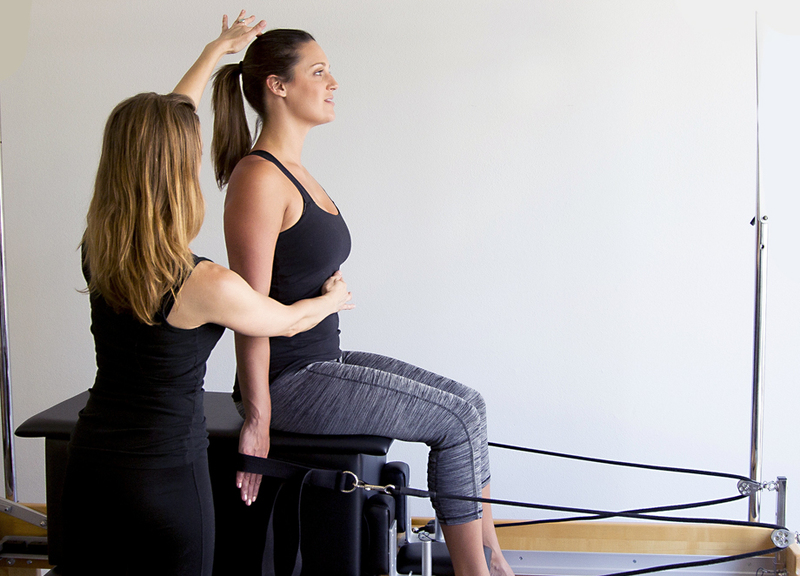 We align, we stretch and we strengthen you to a pain-free body using a combination of Pilates and GYROTONIC® while incorporating manual therapy, energy therapy and modalities such as electrical stimulation, ultrasound and light therapy when needed. You will not only understand the root of your pain and destructive patterns, but will have the tools to prevent further injury. All evaluations are with Gina Calderone, MPT. Pilates is a method of exercise developed by German-born Joseph Pilates. In 1926, Joseph and Clara Pilates brought their exercise system, originally called “Contrology”, to New York City. The Pilates method is a physical movement program designed to stretch, strengthen, and balance the body. Pilates exercise focuses on postural symmetry, breath control, abdominal strength, spine, pelvis and shoulder stabilization, muscular flexibility, joint mobility and strengthening through the complete range of motion of all joints. Instead of isolating muscle groups, the whole body is trained, integrating the upper and lower extremities with the trunk. Centripetal Force Studio uses Pilates to cultivate the awareness necessary for understanding the body’s messages. We teach and encourage a conscious choice to become aware, joining your mental connection to the core of your emotions, energy; spirit...it's a mind and body collaboration. The GYROTONIC EXPANSION SYSTEM® was intuitively designed by Romanian professional dancer, Juliu Horvath to help relieve the chronic pain he suffered from injuries. GYROTONIC® is a combination of Dance, Yoga, Swimming, and Tai Chi producing the system’s unique three-dimensional approach and fluid movement. The method systematically teaches gentle and repetitive circling, spiraling and undulating exercises, which simultaneously stretch, strengthen and elongate muscles while decompressing joints. The methods' specific attention to breath also assists the body's regenerative capacity and opens energetic pathways, increasing blood flow, oxygenation and promoting neuromuscular rejuvenation. Each exercise emphasizes energetic opposition helping to improve internal balance and support. Through constant ebb-and-flow and push-and-pull of the exercises, the connective tissues are massaged increasing range of motion in the body. This process realigns your bone structure to allow the muscular portion to move with ease thereby reducing unnecessary stress. Over time you will begin to settle in to a whole new alignment and muscles which were once dormant will begin to contract. It’s truly transformational. You’ll feel like… you! At CFS our bodywork is a personally customized art form comprised of mobilizing the soft tissues to passive range of motion of the limbs to stretch muscles and lubricate joints while incorporating a deep intention to connect to you.